Brick veneer adds attractive timeless look and increases value of any building constructed in this manner. Shorter installation time and lighter weight save costs in labor, foundations and structural support. If insulation is added to the cavity wall, it will increase thermal performance and add to cost savings. Compared to exposed structural masonry, structural framing/masonry backup can be erected and the rest of the building structure can be competed simultaneously along with the outer veneer. By creating a drainage plane, water can be directed outside of the building. Cast-in-place concrete systems provide many benefits including strong walls for safety and disaster resistance; mold, rot, mildew, and insect resistance and sound blocking ability. If proper insulation is added, it will improve energy. XL Concrete Masonry offers design build services that save time and lower cost of a project. Decreasing administrative cost, lowering risk management and increasing execution of each project are some of the benefits of using design build services. XL Concrete Masonry provides professional consultation to designers, general contractors, and project owners related to concrete and masonry, design aspect, value engineering to achieve results that surpass the customer's expectations. Final architectural appearance, cost effectiveness and efficient solutions is what XL Concrete Masonry lives by throughout each phase of a project. Commercial concrete curbing is done by using handset or machine-placed methods. Our concrete curbing services are used when building retail centers, office parks, warehouses, hospitals and when replacement is needed. Full concrete paving services include concrete approaches, concrete curbing, concrete sidewalks, cast-in-place floors, and all forms of decorative flatwork. XL Concrete Masonry's experienced team executes each commercial concrete paving project precisely and finishes on time and within the budget. Commercial concrete sidewalks are part of the complex concrete paving services offered by XL Concrete Masonry. High quality concrete, durable sidewalks, precise cuts, perfectionist approach is what sets XL Concrete Masonry apart. Concrete spandrels/lintels are typically used when building parking structures. They provide support for the precast deck system as well as they meet the height requirement for the perimeter parapet wall. Concrete Spandrels are part of the full structural concrete services offered by XL Concrete Masonry. XL Concrete Masonry provides design and installation of custom commercial paving solutions including driveways, walkways, courtyards, patios and pool decks. Concrete unit paving has the performance of natural stone and offers a more economical alternative to concrete paving projects. Permeable pavement solutions allow your installers to transform walkways, parking lots and streetscapes into environmentally responsible solutions by allowing precise water-management and reduction of runoff. XL Concrete Masonry offers design build services that save time and lower cost of a project. Decreasing administrative cost, lowering risk management and increasing execution of each project are some of the benefits of using design build services. 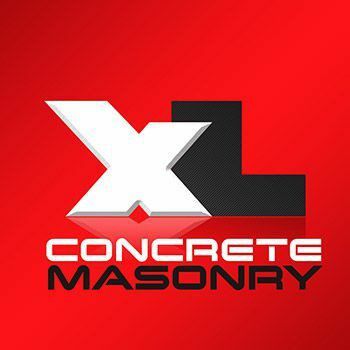 XL Concrete Masonry provides professional consultation to designers, general contractors, and project owners related to concrete and masonry, design aspect, value engineering to achieve results that surpass the customer's expectations. Final architectural appearance, cost effectiveness and efficient solutions are what XL Concrete Masonry lives by throughout each phase of a project. Glass Fiber Reinforced Concrete has been used to create thin architectural cladding systems, ornamental concrete features such as domes, statues, planters and fountains. GFRC systems are aesthetically-pleasing, energy and cost-efficient. XL Concrete Masonry's team is proficient at installing GFRC systems. XL Concrete Masonry is the expert in installing glass block projects with sophisticated designs. Glass blocks are generally used as aesthetic dividers that allow light transmission. Glass blocks can be also used as walls, windows, skylights, shower walls, fireplaces, floors and more. Glazed concrete masonry units offer numerous benefits such as maintenance free imperious finish weather resistance, including mold and moist resistance, fire protection and sound absorption. XL Concrete Masonry's team is experienced in installing Glazed CMU. It offers a wide variety of colors, shapes and scoring patterns. insulated concrete form (ICF) is a system of formwork for reinforced usually made with a rigid thermal insulation that stays in place as a permanent interior and exterior substrate for walls, floors, and roofs. The forms are interlocking modular units that are dry-stacked (without mortar) and filled with concrete. The units lock together somewhat like Lego bricks and create a form for the structural walls or floors of a building. ICF construction has become commonplace for both low rise commercial and high performance residential construction as more stringent energy efficiency and natural disaster resistant building codes are adopted. ICFs may be used with frost protected shallow foundations (FPSF). XL Concrete Masonry offers mechanically fastened stone veneer services for projects throughout Nevada and California. The appearance, design and color palette of sandstones make every project a one-of-a-king architectural masterpiece. XL Concrete Masonry's team has extensive experience installing natural stone veneers to both commercial and estate home projects. The team handles installation of sandstone, travertine, cut-to-fit granite, artificial stone, stone veneer, fireplaces, flagstone paving, cobblestones, paving stone, tile and many more. The vast color range and design options along with the stone's durability and sustainability makes natural stone veneer services the one of the most sought-after. Precast wall panels and other precast products are formed at a manufacturing facility and transported to the job site rather that formed directly at the site where environmental factors and the construction schedule preclude tilt-up wall as a viable option. For a precast construction project, the panels must be smaller and more manageable to allow trucks to haul them over the road to their final destination. This places greater design restrictions on architects and limits the applications where precast construction can be used. XL Concrete Masonry is an experienced contractor in installing precast wall panels and other precast products with delicate care. XL Concrete Masonry is experienced in installing nearly every masonry product in the market today. It handles both commercial and estate home projects. The team installs sandstone, travertine, cut-to-fit granite, artificial stone, stone veneer, fireplaces, tiles and much more. Stone flooring increases the value and add beauty to any project. Structural brick as an alternative building method is steadily gaining popularity among mason contractors, engineers and industry professionals. Its beauty, permanence, high resistance to sound, wind and seismic forces along with low maintenance and high resale value are the reason why structural brick is being used in various construction projects. Structural CMU services are one of the commercial concrete services provided by XL Concrete Masonry. This included cast-in-place walls and floors, slab-on-grade, foundation, tilt-up and all forms of decorative flat-work. Concrete masonry units may be formulated with special aggregates to produce specific colors and textures for finish use. A variety of specialized shapes exist to allow special construction features. Structural concrete is one of the many commercial services offered by XL Concrete Masonry. This includes foundation, slab-on-grade, cast-in-place walls and floors, tilt-up and all forms of decorative flat-work. The team at XL is highly-trained, experienced and proficient in working with any masonry product. XL Concrete Masonry uses tilt-up wall construction in large commercial construction projects. Using this method speeds up the construction process of a project. XL Concrete Masonry is one of the few constructions companies in Nevada and California successfully using the tilt-up method. XL Concrete Masonry provides professional consultation regarding material, design and value engineering to design teams, general contractors and project owners. The team's main goal is to exceed the expectations of each customer.